I never met Smoky Dawson, but I knew of him all my life. 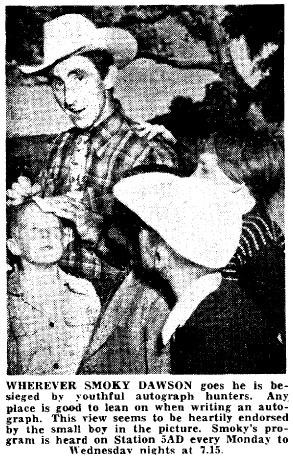 The closest I would have come to him was scout camps at Ingleside next door to his ranch and later going riding at his ranch. I was too young to have heard him on radio, but I do remember him from Channel 9 Super Flying Fun Show where Smoky was a regular guest. He was also a regular on other television shows as I was growing up. 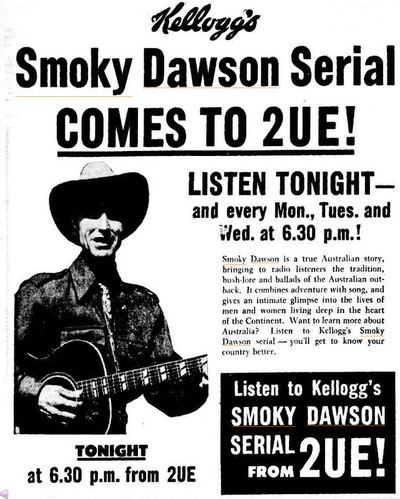 Smoky Dawson had a long career in radio. 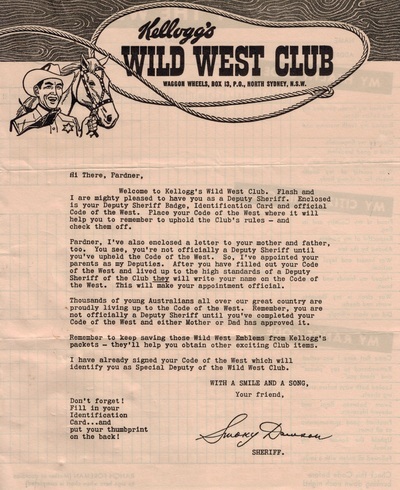 Whilst I will mention other shows he did and his singing and showman aspects, what I want to concentrate on here is the Kellogg's Wild West Club and the Smoky Dawson show that ran from 1953 to 1962. 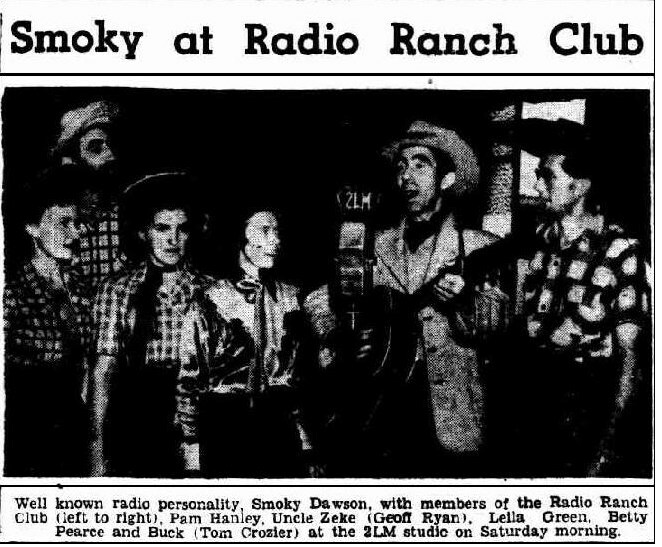 Smoky Dawson kicked off on radio at 3KZ in 1937 as Smoky Dawson and the Pepsodent Rangers. 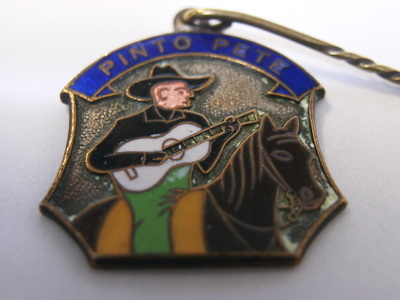 It was a 15 minute country and western program scripted by Smoky, which replaced the existing American country and western program Pinto Pete and his Ranch Boys on Tuesday nights. 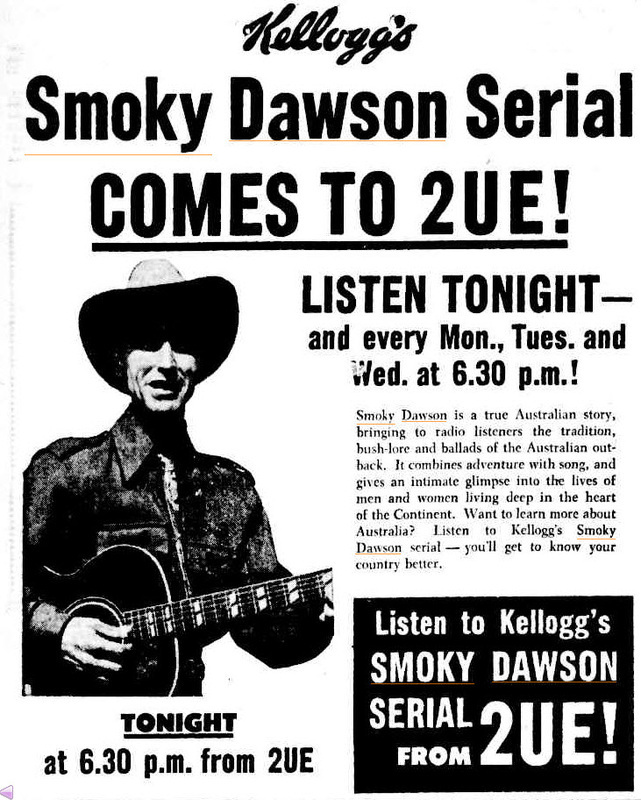 It was the first Australian country and western music show to ever replace a transcribed (pre recorded on disc) overseas show on Australian commercial radio. He also played Hawaiian music with his South Sea Islanders group on Thursday nights. 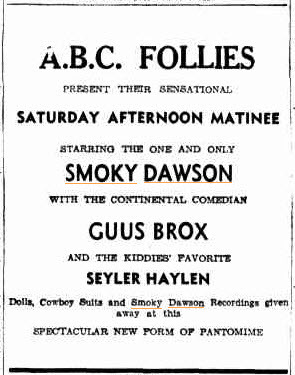 1939 it was his Smoky Dawson Hillbilly Club another 15 minute show on Sunday nights. 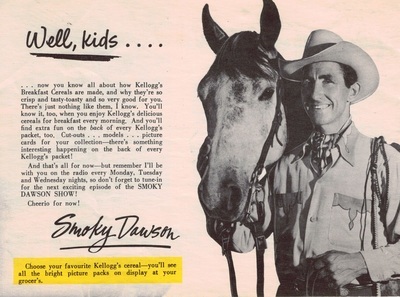 Also at 3KZ we heard Smoky Dawson and The Five Star Rangers on Sunday nights. 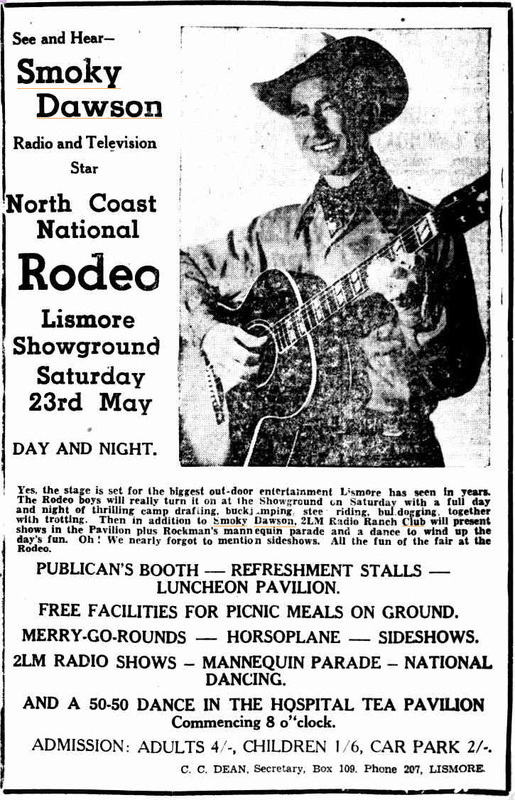 Commencing April 1940 he made a move and we heard Smoky Dawson and his Mountaineers on Thursday nights at 3LO. 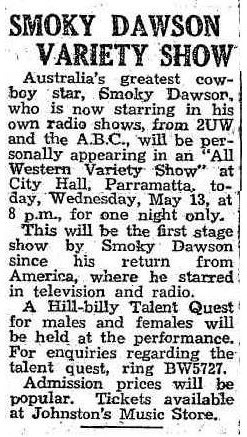 Also at 3LO in August 1940 he moved to a 30 minute format on Tuesday nights with Smoky Dawson and The Old Timers. 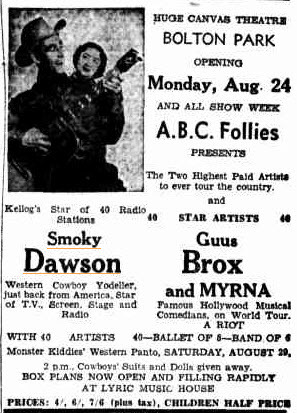 In 1946 on 3XY there was Smoky Dawson's Music Master Mondays and Fridays. 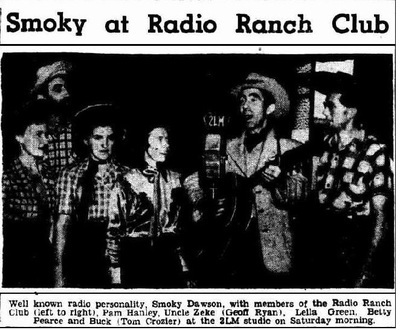 Smoky's career on radio continued until he joined the Army Medical Corp after being downgraded due to a heart problem. 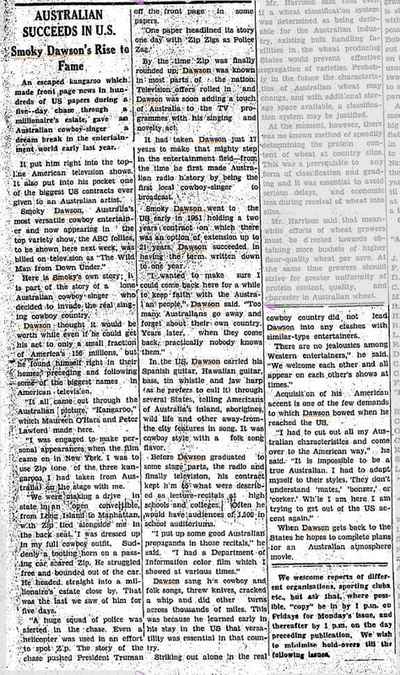 In 1943 he was transferred to the First Australian Army Entertainment Unit. 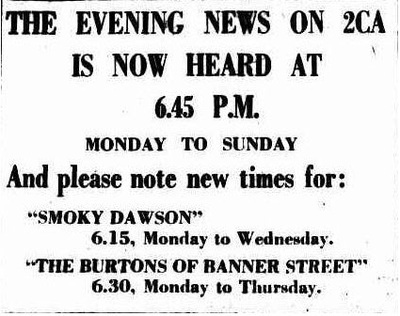 On the 13th March Smoky and Dot were married. 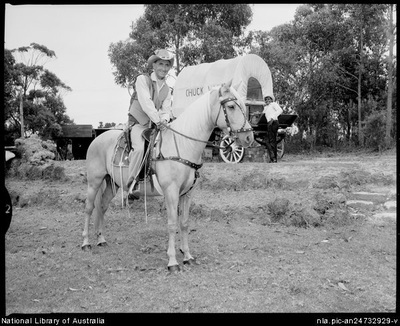 After the War, Smoky joined tent shows, learnt how to throw knives, battleaxes and rope work along with rough riding. 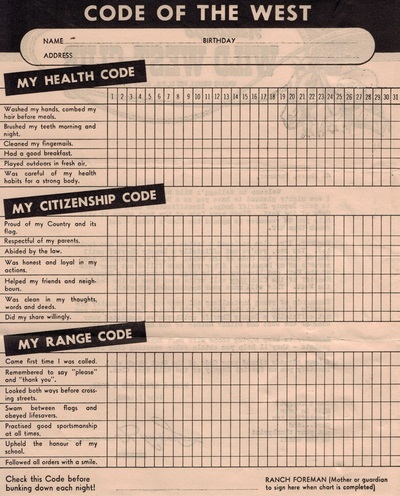 All skills that would come in handy in later years. 1950 and a plan to make a short film with Smoky as an Australian Gene Autry or Hopalong Cassidy. In December 1950 this was approved with a budget of 200 pounds. 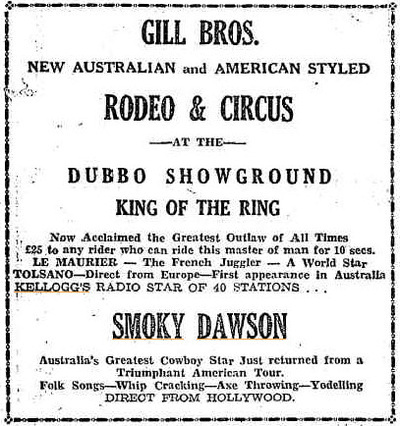 The film was built around Smoky's skills with music, horses, whips and knives. 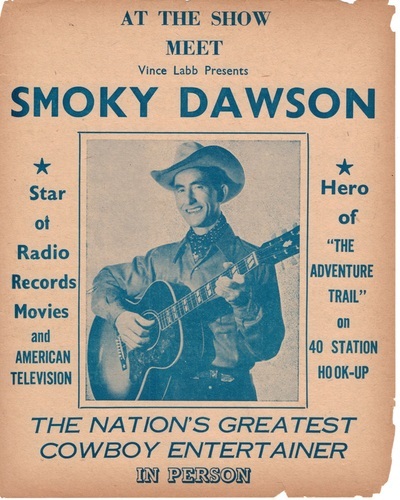 While waiting for the release of the film, Smoky was approached by John Calvert a visiting American Showman who wanted Smoky to tour America and make personal appearances under the direction of his company. Here I cut the story short and recommend you track down the book 'Smoky Dawson - A Life' so you can learn about the adventures Smoky and Dot had in the U.S. particularly with Zip the Kangaroo and his escape and the ensuing panic caused to the population who hadn't experienced a wild kangaroo. 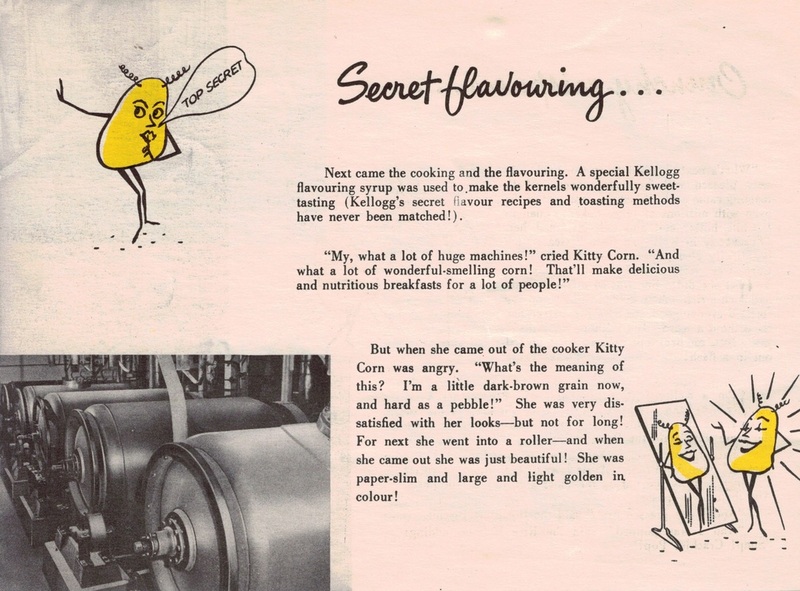 The story of Zip and press releases had stirred up interest back home and J. Walter Thompson the advertising agency for Kellogg's had finally seen Smoky's film and a message was sent to their New York Office 'Find Smoky Dawson!' 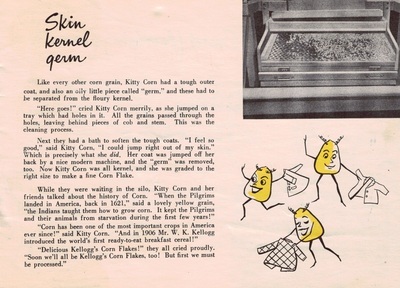 and this is where our story really starts. 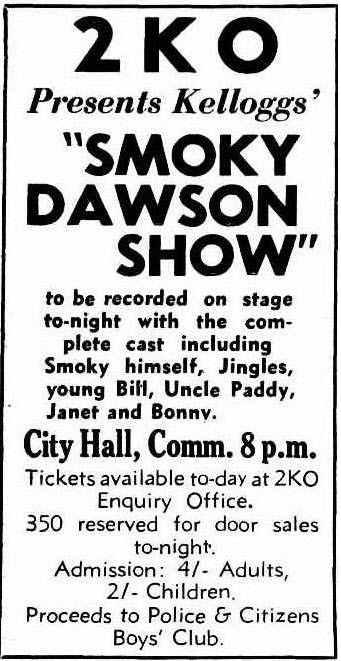 December 1952 the Smoky Dawson Show was first broadcast. The show fit the skills and lifestyle of Smoky Dawson, and Smoky Dawson the character, an outback stockman, singer, guitarist, whip cracker, knife thrower, mimic of bush and animal sounds, as well as legendary horseman, was born. Cres Jenkinson Produced and Peter Yeldham was the script writer, then Don Haring who later had fame writing the Larry Kent - I Hate Crime pulps. 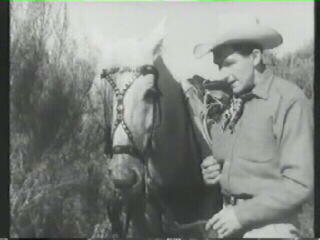 The setting was Jindawarrabel, a property somewhere in the outback, owned by Paddy O'Leary, played by Marshall Crosby. 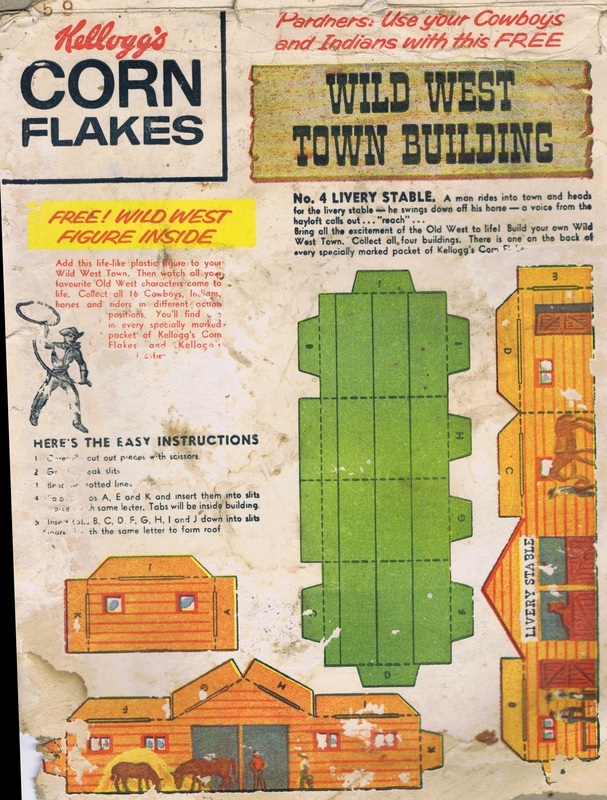 Paddy's daughter Bonnie was Yvonne Lewis, Ken Wayne the outlaw Gogan and Dot played the Governess Janet, who was there to educate Paddy's young nephew Billy, played by none other than Ray Hartley. 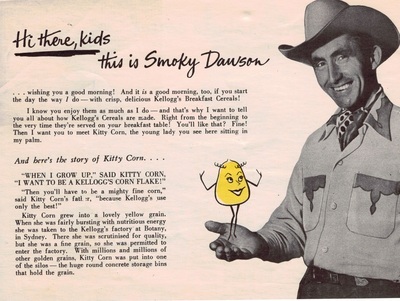 Smoky Dawson had a sidekick by the name of Jingles who in real life was Alan Herbert. 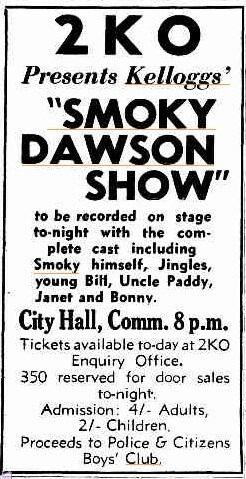 'Bud' Tingwell was a regular on the show as the local policeman. 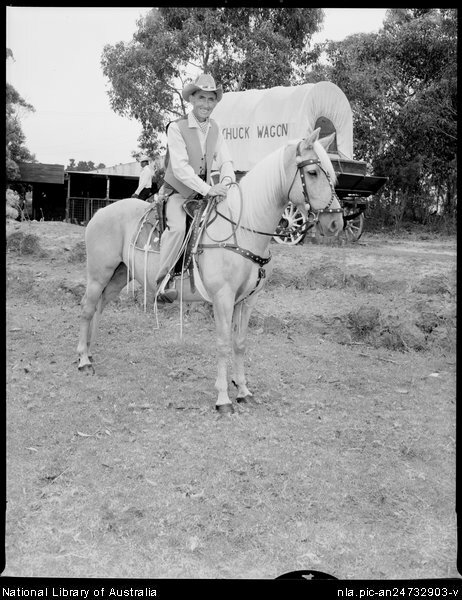 The real hero of many of the stories was Smoky's beautiful Palomino horse, Flash. 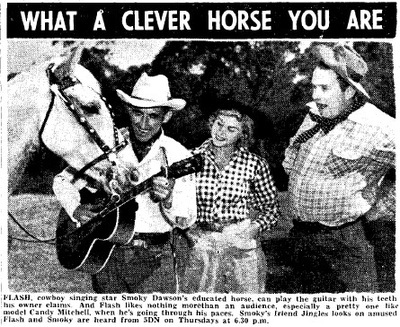 A well trained and intelligent horse loved by millions of kids as well as Smoky. 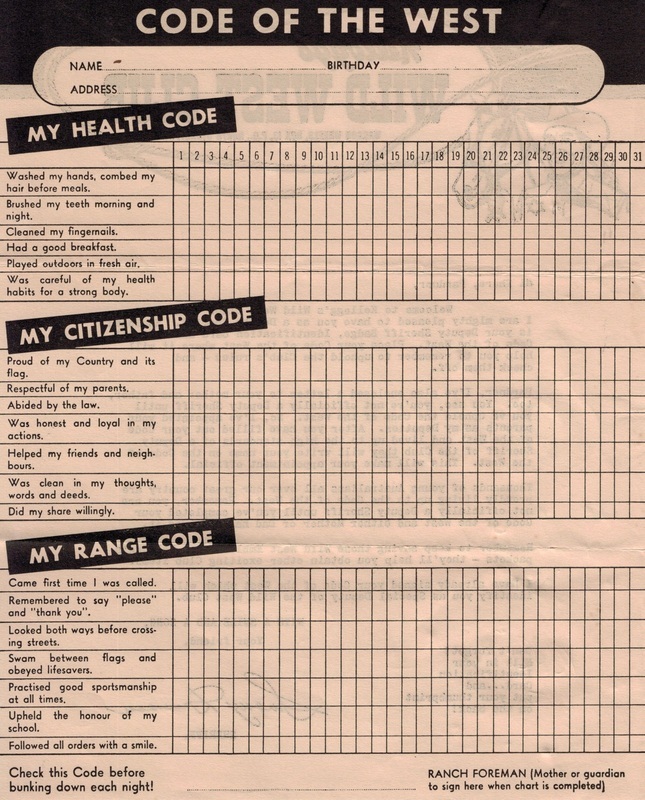 Around 1 million youngsters applied for and received membership. 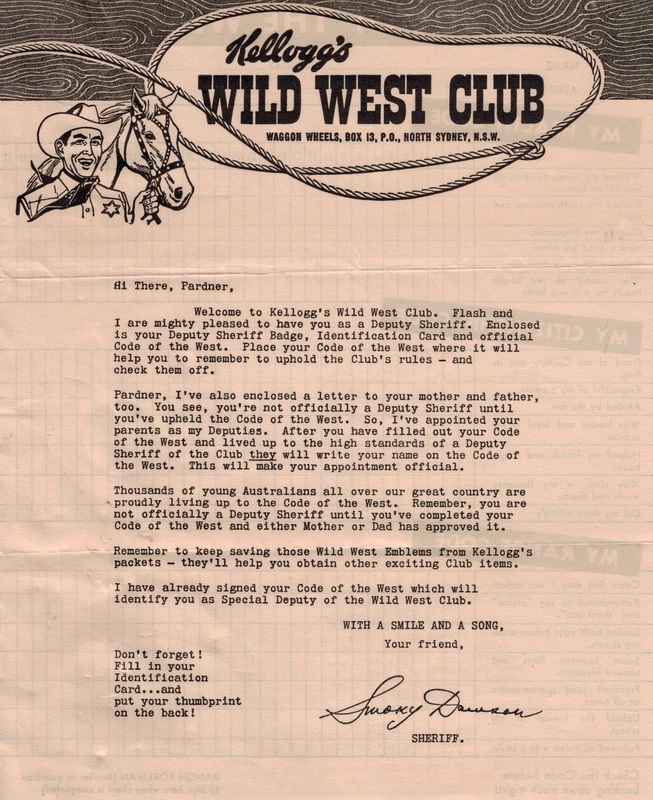 As you can see from the images below, the child received an Official envelope containing a letter from Smoky Dawson welcoming them to the Wild West Club. It warns them they are on 30 day probation and have to satisfy their parents to the criteria as laid out. 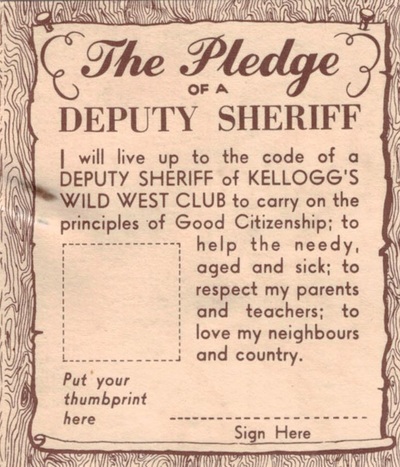 They had a check list on the reverse of the letter so that they could keep track of their behaviour. There was the code of the west Certificate so that when their parents were satisfied they had met the criteria after 30 days, the parent could fill in their name on the certificate. 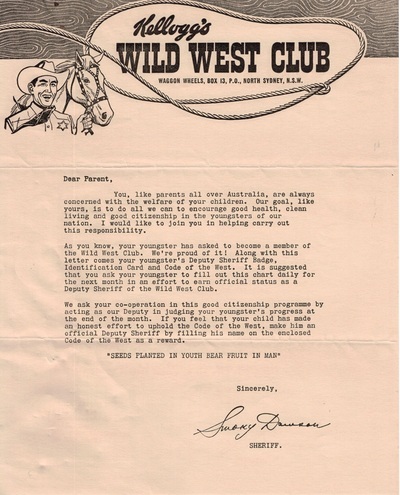 There was also a letter to the parent explaining the power that had been given to them. 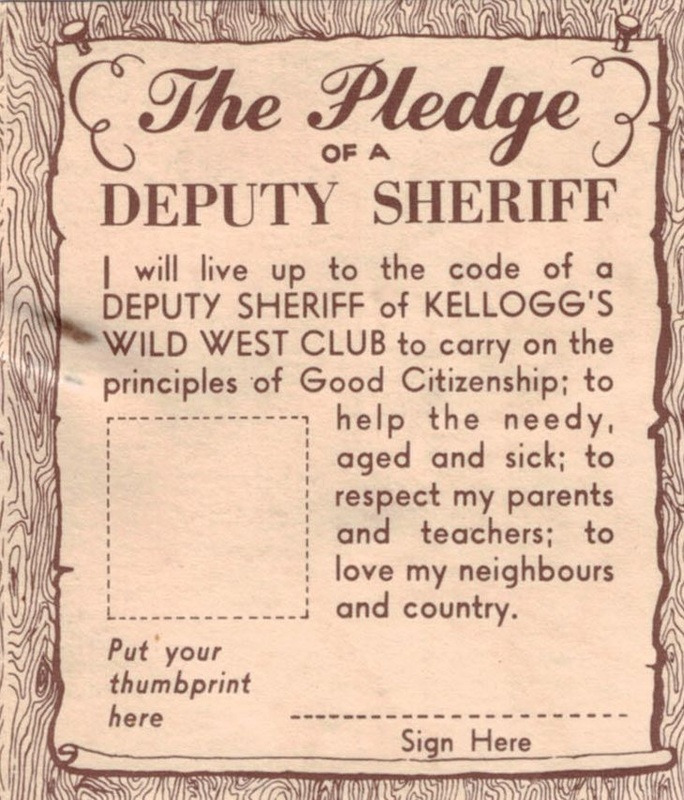 The child then received their Deputy badge, and their certificate 'Code of the West' complete with name and also their Identification with the Pledge on the reverse. 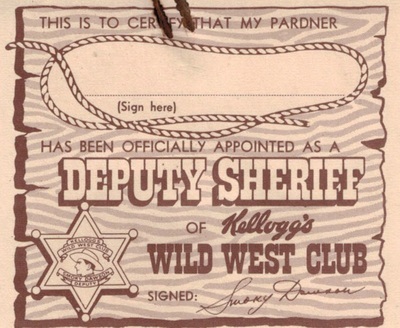 Kellogg's really got their moneys worth from the Kellogg's Wild West Club and their association with Smoky Dawson. 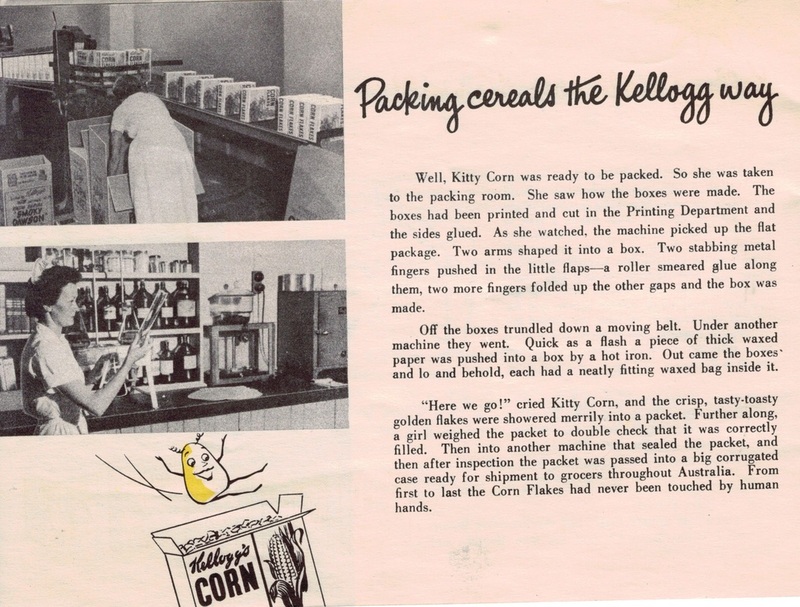 The expense of running the club would have been high, but the membership of 1 million, many of whom were sending in coupons from the Corn Flakes packets to earn other radio premiums, not to mention the gifts inside and on the packets, must have sent the packets racing off the shelves. 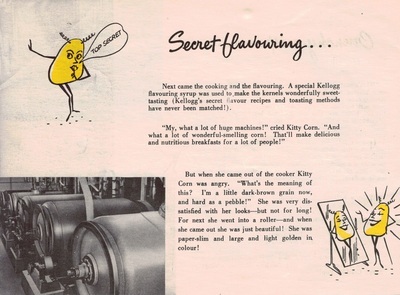 They had a successful sponsorship of Howie Wing, then followed that up with Martins Corner until Smoky Dawson came along. 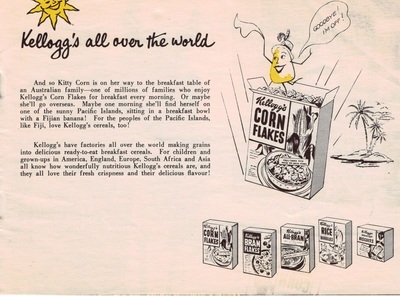 I don't know how successful Martins Corner was for Kellogg's, I only know of the one premium given away by Kellogg's in that 12 year sponsorship and that was a board game based on the characters and the Martins Corner show. 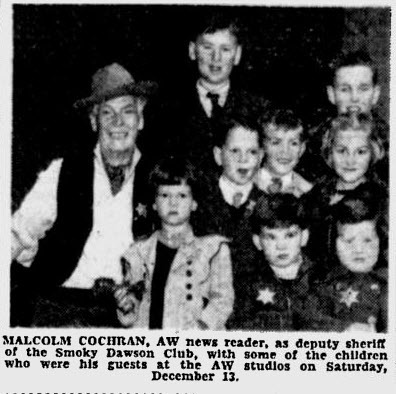 But Smoky Dawson and the Wild West Club was hugely successful and the children of Australia certainly supported the sponsor. 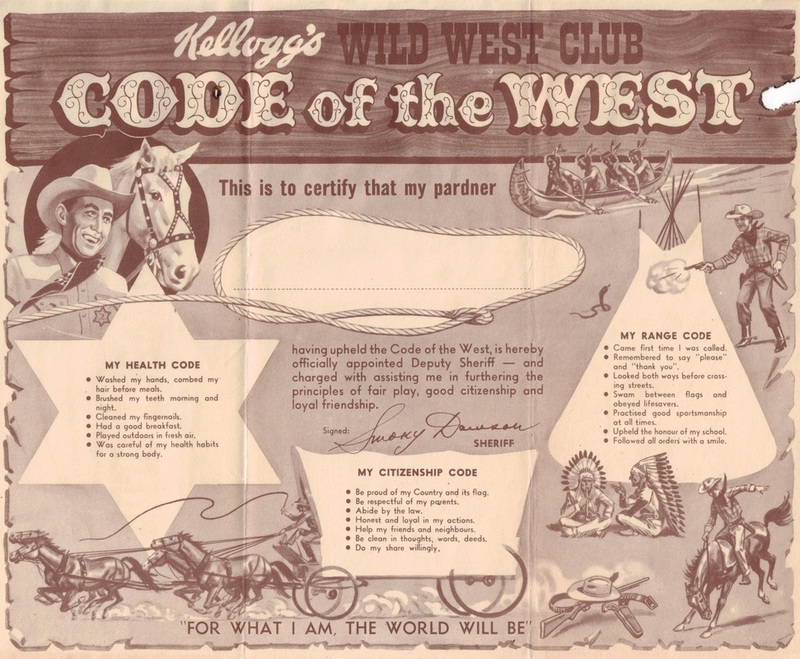 In 1955, Kellogg's insisted that the format of the show leave Jindawarrabel and become the equivalent of the format for their American series, Wild Bill Hickok. It was high adventure and spanned the young-old audience with a 30 minute format every Thursday prime time 7.00 p.m. for the next 7 years. 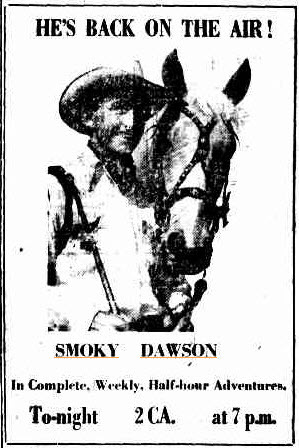 The Adventures of Smoky Dawson. To say Smoky and Flash were popular would be a gross understatement. 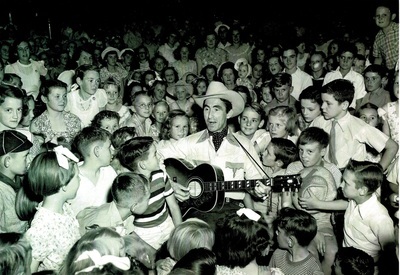 They did thousands of personal appearances. Sometimes as many as 4 a day. Kelloggs arranged for special hand-tooled single-action six guns to be made for Smoky by the Colt organisation and Smoky was sworn in by the Sheriff of Kern County California, as a Deputy Sheriff of that county and was dispatched a star to wear. 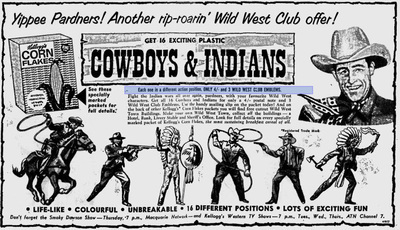 The police armory had to doctor the colts before the Commissioner would grant Smoky a licence. 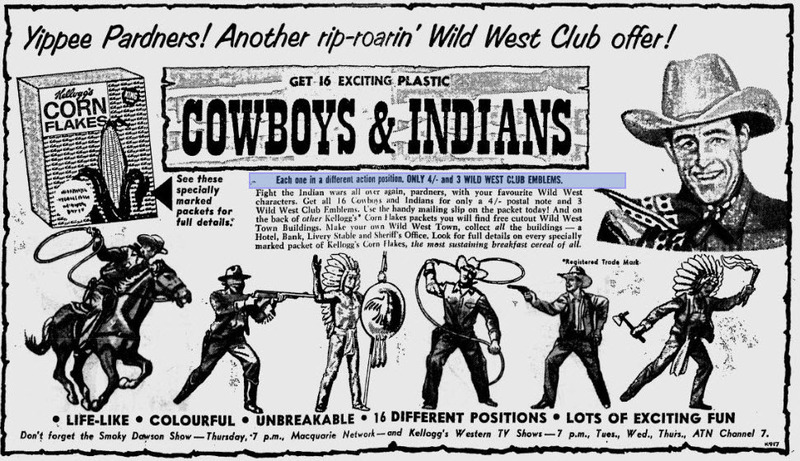 The Colts then only fired blanks. 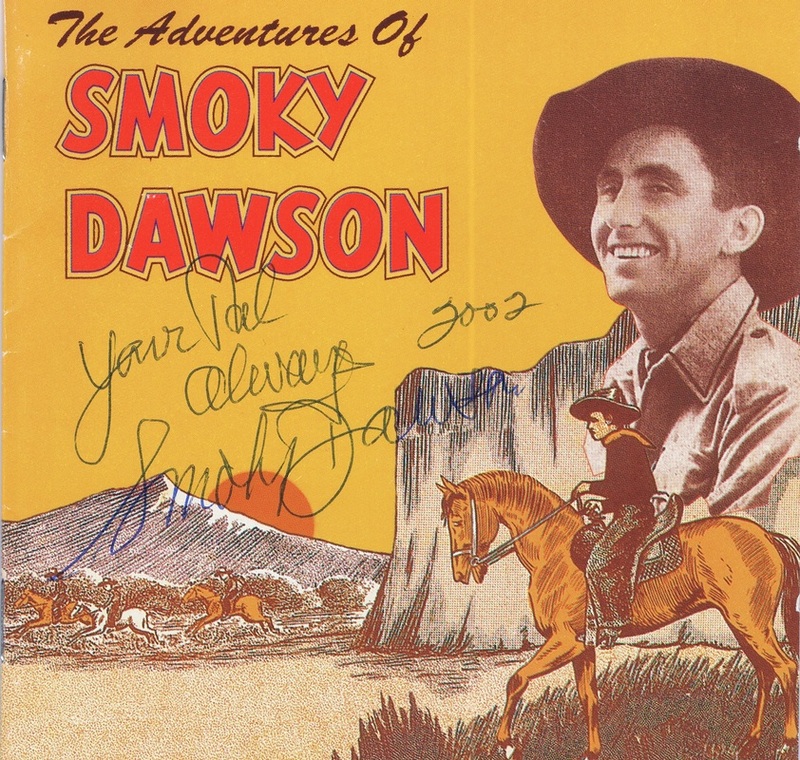 The Adventures of Smoky Dawson came to an end in 1962 but Smoky Dawson MBE continued on until he passed away in 2008 at age 94. 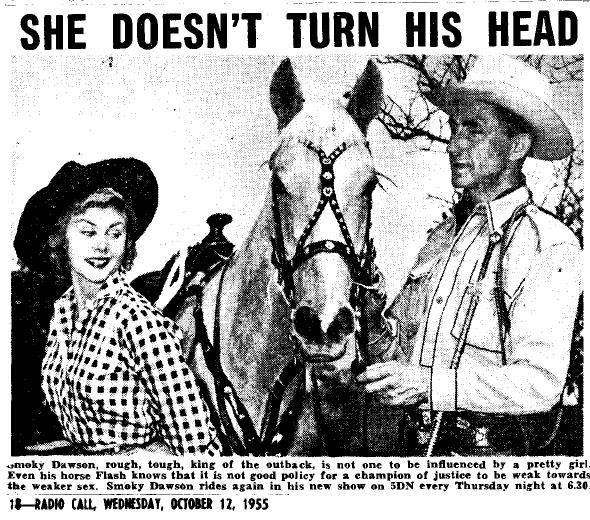 Dot passed away in 2010 at age 104. 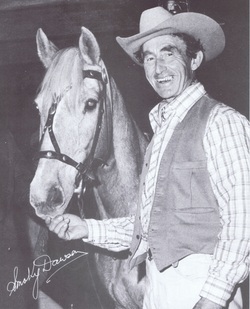 Flash the Wonder horse died in 1982 at age 35. 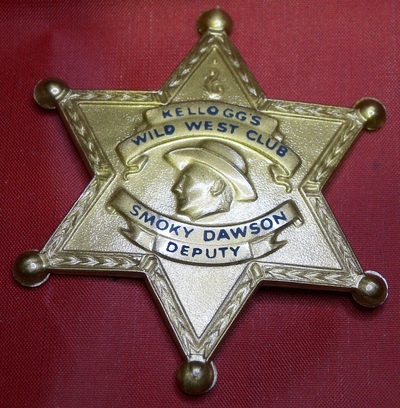 Unfortunately, I don't yet own a Smoky Dawson badge in my collection. It is one that I am always looking for. Nor do I have an original copy of the envelope contents of 'Code of the West', letters and pledge. 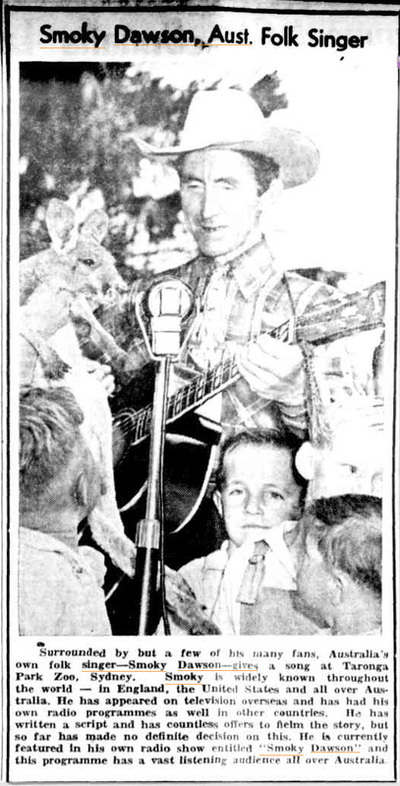 Those images I scanned from Paul Kelly's collection of Australian Country Music memorabilia. I thank Paul for allowing me access to them and copying them for this website. Also the pictures of the Smoky Dawson Guitar and the Kellogg's Book etc. I know he enjoyed going through my 78's and he has an incentive to find another Kellogg's Wild West Club Badge and documents for me. 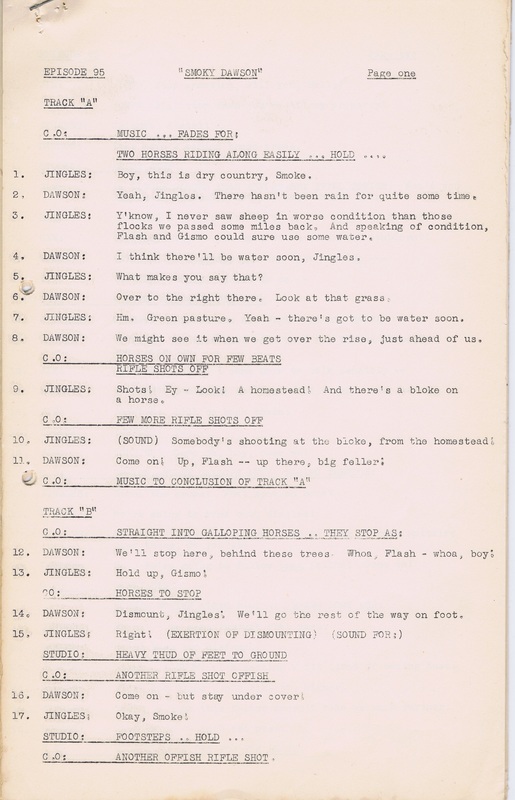 It is great when collectors work together. I can however include some items that are from my collection. 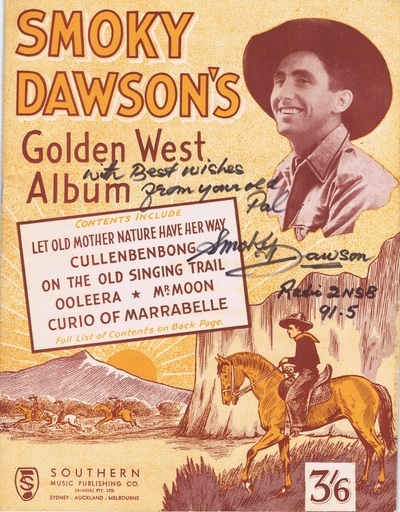 I admit it here, I am a fan of Country & Western Music, particularly the old style and Smoky Dawson certainly has his place in amongst my 78's, LPs and CDs. 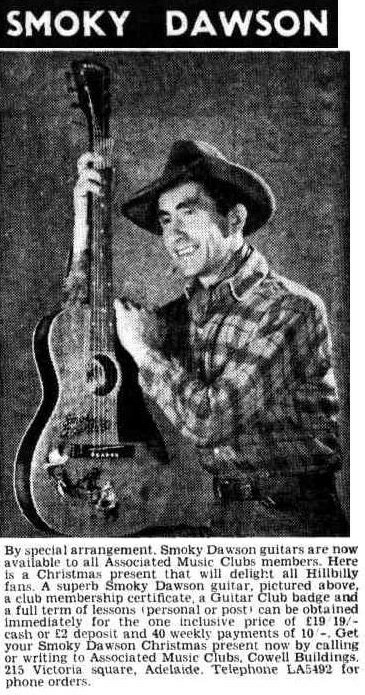 Several of his songs never leave my mp3 player, 'Ridin' and 'Good time Radio' with the Howie Brothers to name two. I have been trying to get permission to have 'Good Time Radio' play here on this site for about the last 6 years and it is being assessed again at the moment. It is a song that explains this website and names many popular Australian radio series in its lyrics. 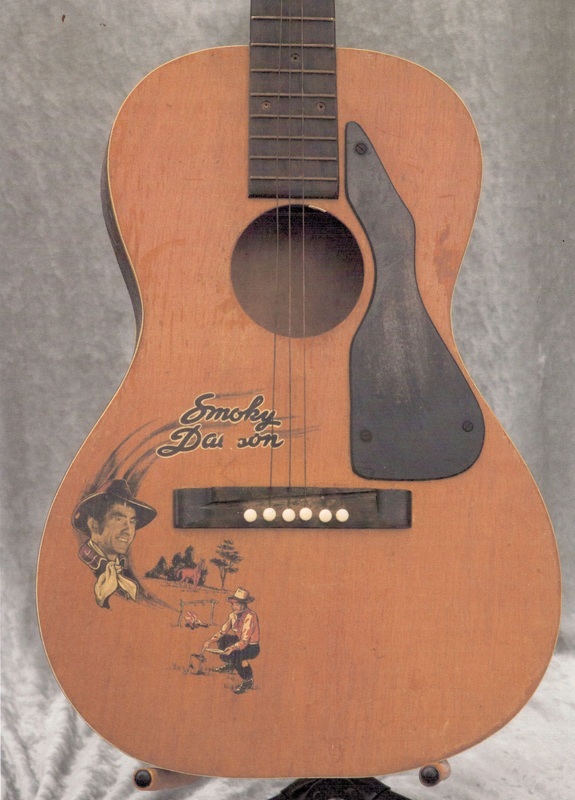 Check out the Howie Brothers website where the CD set that contains the song is available for sale. While you are there, you can grab the 2CD set of 'The Adventures of Smoky Dawson also $28.00 It contains about 5 episodes of the serial as well as extras such as an introduction by 'Bud' Tingwell and reminisinces by Smoky & Dot as well as the theme song 'Ridin' and the song 'Jindawarrabel' which I just happen to be listening to as I write this. I have linked to 'Good Time Radio' on youtube in the meantime and you will see it at the bottom of the page. 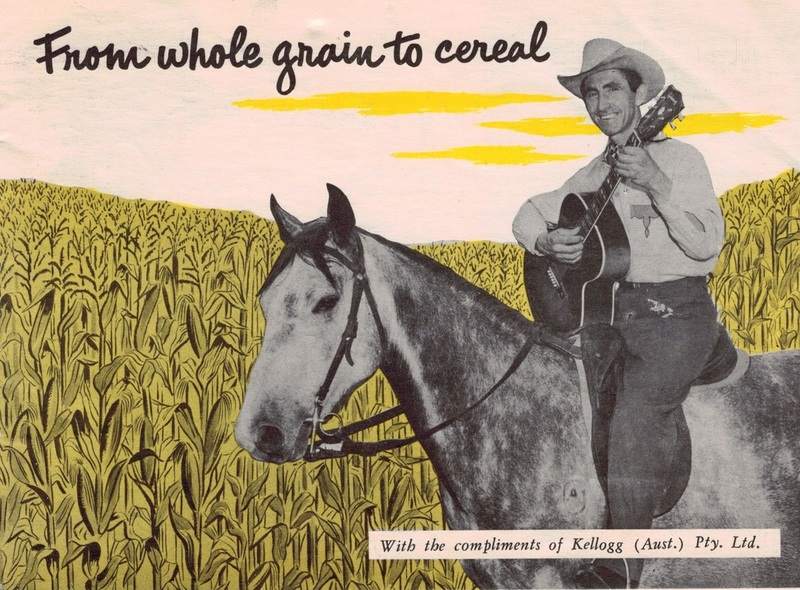 Unfortunately the sound quality is poor. 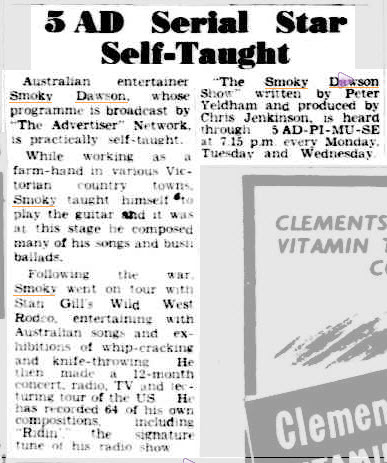 Also at the bottom is a youtube clip released by NFSA showing Smoky throwing knives, axes and battle axes at some poor fellow. I swear he hits him a couple of times as well. 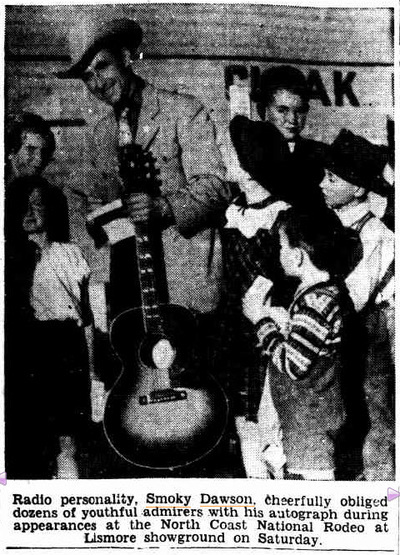 This would have been filmed prior to his trip to America, so late 1940's.. 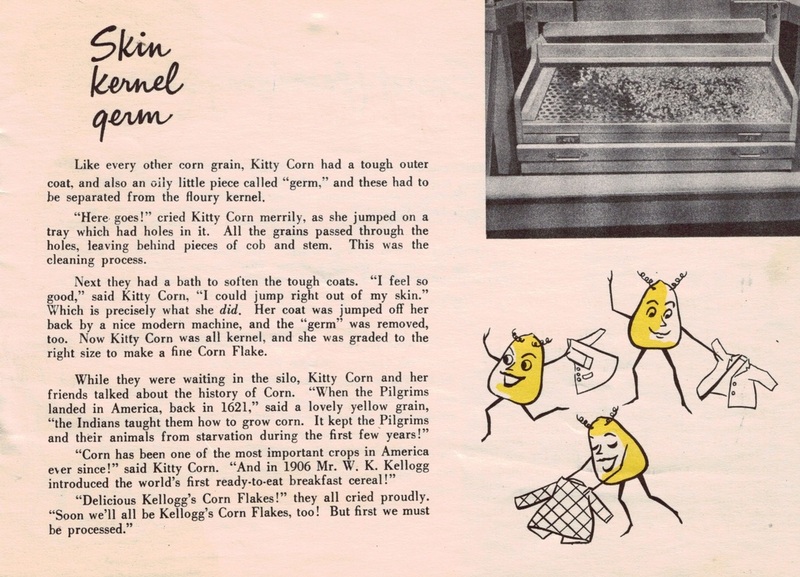 I will continue to add information, pictures and scans as they come to hand. 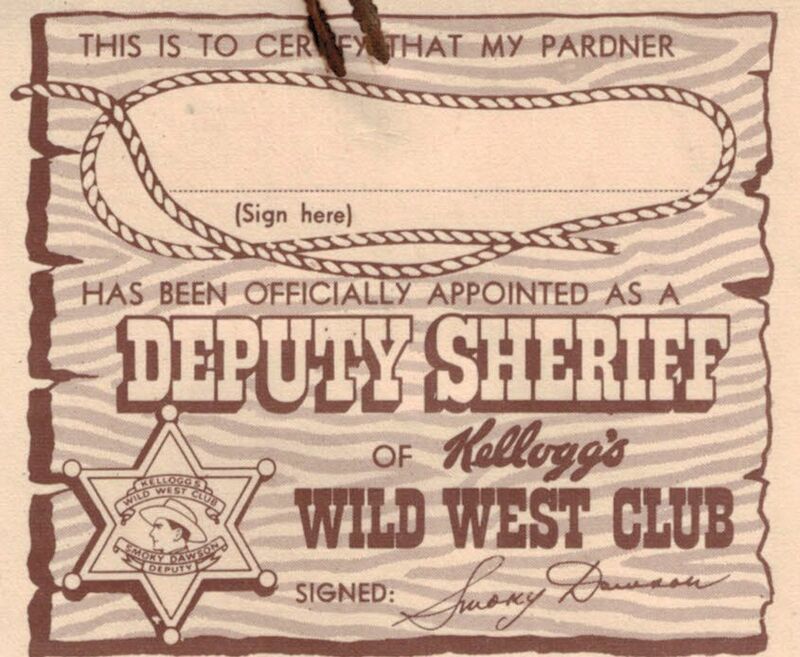 If you were a Deputy in the Kellogg's Wild West Club, please take the time to write to me and tell me of your experience and what you remember as a club deputy.